Running Press Kids, 9780762449507, 288pp. The dream is all white from a memory that is too real, and its melody has continued to haunt Alpha, even though she has moved as far away from temptation as possible. Eight years after she was exposed to her first and only addictive musical track from the Corp, Alpha has established a new life with a band of her own in a city that has given her the space she was seeking, Los Angeles. However, it only takes one urgent call to bring Alpha back home to Anthem, the older brother who raised her as well as a revolution, and Omega, her twin brother whose contrasting personality makes her feel whole. As Alpha spends more time in the Web, she notices that the number of people who look sickly and addicted seems to be rising. With Anthem's health declining, Alpha and her friends will have to dig deeper into the mainframe than ever before in order to find the root of the Corp's re-emergence. 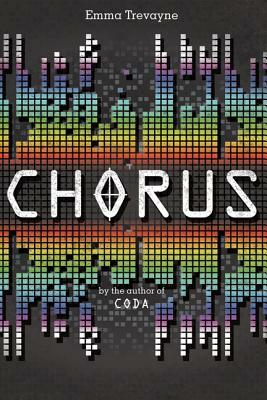 Emma Trevayne's sequel to Coda concludes the series with a crescendo of unexpected twists, hard-earned triumphs, and agonizing decisionsall coming together as a symphony of pure emotion. Emma Trevayne is a full-time writer and the author of Coda,(a nominee for both YALSA's Best Fiction for Young Adults list and ALA's Rainbow Book List) and Flights and Chimes and Mysterious Times, as well as a co-author of the upcoming anthology The Cabinet of Curiosities. She is an avid music collector, a lover of programming languages, and a photographer. She currently lives in England. You can visit her online at emmatrevayne.com or via Twitter @EMentior.